Josh Picard De La Paz led a tour Saturday. The presence of Segways has irked neighbors. 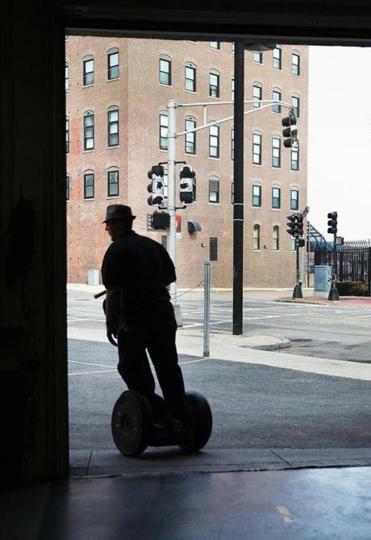 A company that runs Segway rentals and tours in the North End has long been feuding with neighbors over where the two-wheeled vehicles can operate. But now, the business is in jeopardy of losing the prestigious Commercial Street location where it has been since 2011. The city has deemed it illegal for the company, formerly called Boston Gliders, to operate at 420 Commercial St., a former gas station at a busy corner in the North End. The company, now called Boston By Segway, must find another home. The company’s defiant frontman Allan Danley said the business he helps run will not budge, and he vowed to push ahead with lawsuits against the landlord and the city. The company has had a series of troubles over the years, including mounting fines from the city and the ire of residents who have become increasingly uneasy with Segway operators and Danley’s combative style. 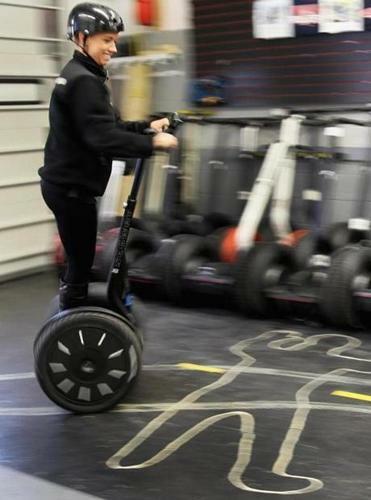 Boston By Segway’s Allan Danley said his firm has amassed $200,000 in violations, which he vows not to pay. 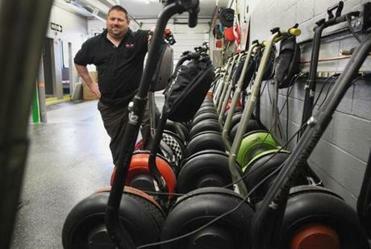 The latest blow to the Segway company began six months after it moved to Commercial Street nearly two years ago. The city deemed it illegal for the company to operate at its current site, which is zoned for a gas station. The city has cited the landlord for allowing the Segway business there, said Joseph Carregal, a spokesman for landlord Francis Lauria. Carregal said Lauria will not renew the company’s three-year lease, which expires next March. Danley said the Segway business attracts 50,000 tourists each year who each pay $60 for a one-hour trip through Boston’s historic sites. But the company has also been locked in a years-long feud with the city and neighbors, who had been stunned to see the two-wheeled machines popping up in their neighborhood and zooming down their sidewalks amid tourists, mothers with strollers, and dog walkers. “It’s too much of a walking area to have those things here,’’ said resident Janet Gilardi. City officials banned the machines from the parks and sidewalks, and limited where Segway tours could operate. But the company has often scoffed at the restrictions, amassing $70,000 in violations by the end of 2011, the Globe reported. Danley said that figure has climbed to $200,000, which he insists he will not pay. Carregal said that the landlord attempted to address the illegal zoning issue after receiving notification from the city last year. Alisha Strand of Seattle hopped on a Segway before heading out on a tour with Boston Gliders. The landlord unsuccessfully sought to amend the zoning as well as to obtain the approval from the North End/Waterfront Neighborhood Council and the North End/Waterfront Residents’ Association. Both groups advise the Boston Zoning Board of Appeals, which denied the landlord’s request last week, city officials said. The developments were posted on northendwaterfront.com, the neighborhood blog. The zoning board said it will allow Boston by Segway to remain until the end of the year, city officials said. Carregal insisted that the landlord was not seeking a permanent zoning change, because long-term support from the city and neighborhood would have been difficult, if not impossible, to obtain. He said the landlord wanted a reprieve from mounting fines. Eastera Phou, owner of Boston By Segway, and Danley said they blame the landlord for failing to ensure that all permits and paperwork had been properly filed with the city. Danley said that the company, which operates from March through November, has been unfairly targeted by residents and the city and that no other tour operation has been subjected to as many restrictions. Carregal said that when the company first moved in, there was nothing in the city code addressing Segway usage. “It did not exist until [Danley] was already there and began fighting with everyone under the sun,” he said. Meghan Irons can be reached at mirons@globe.com. Follow her on Twitter @meghanirons.